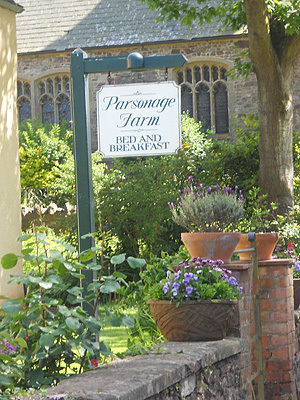 Parsonage Farm Bed & Breakfast is a traditional 17th century farmhouse and smallholding with log fires, comfortable accommodation, delicious meals, and beautiful gardens. We have a walled kitchen garden, apple orchard, honey bees and are situated directly adjacent the parish church of Over Stowey, a quiet village in the Quantock Hills a designated "Area of Outstanding Natural Beauty" in Somerset. 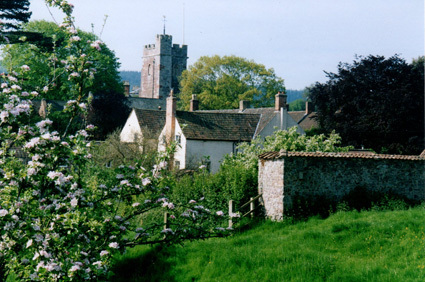 The picturesque village of Nether Stowey with it's Coleridge and Wordsworth connections is a twenty minute walk across the fields. Walks over the hills, woodland and moors begin at the doorstep. "The quality of life here is rich. That notion of 'exclusivity', familiar to those drawn to five star hotels, is countered here by a profound inclusivity. This is a place that encourages you to unwind." © Parsonage Farm. Design: cyberpress. CMS: GetSimple.